If you are having relationship issues, the problem could be that you and the other person (or people) are not a good elemental match. One of the basic tenets of magical studies is that everything in this Universe is made up of some combination of the 4 elements: Air, Fire, Water and Earth. Having an understanding and knowing how to work with the 4 elements allows you to understand (and create) anything you desire. This includes an understanding of relationships that will be compatible with us. Our personalities reflect the characteristics of the element or elements that are dominant in each of us. If our elemental balance is not compatible with another person’s then communication problems and other relationship problems can exist. The first lesson in understanding how the 4 elements might have a role in your relationship issues is to have a basic understanding of the characteristics of the 4 elements themselves. As you read through the following descriptions try to see which fits the type of personality traits you exhibit and other people that you know. Air Element – corresponds to seeing, breathing, speaking, hearing, planning, thinking, believing, memorizing, communicating, learning, teaching, information, ideas, wisdom, understanding, worry, sensation, awareness, opinions, data, memory, mind. Fire Element – corresponds to energy, power, will, desire, anger, pain, motivation, radiance, passion, initiative, aggression, limitation, endeavor, activity, creative, willingness, urge, inspired, excitable, courage, bravado, compulsion, fanaticism, frustration, resentment, rage, freedom. Water Element – corresponds to emotions, feelings, intuition, compassion, empathy, sympathy, knowing, devotion, quest, aspiration, intention, appreciation, integrity, harmony, beauty, balance, serenity, fluidity, grief, apathy, joy, love. Earth Element – corresponds to strength, money, foundation, endurance, structure, mundane world, serenity of beingness, solidity, boundaries, permanence, land, commerce, products, confidence, loyalty, persistence, stubbornness, fortress, security, anchor, barter, substance, body, base, possessions. Now think about how each of these elements react to each other. For example, you know that you can blow out a candle so too much Air can smother Fire. Let’s say you as a predominantly Fire Element person are in a relationship with a predominantly Air Element person. You can see how applying the 4 element characteristics can predict that relationship issues are bound to occur. Another example of a pairing that could be difficult would be in the case of a predominantly Water element personality matched with a predominantly Air Element person or predominantly Fire Element person. Water cannot accept air alone or fire alone easily. Water accepts air that is carrying fire. This case demonstrates how a Water Element person would probably have less relationship issues with a person who is an Air/Fire mix rather than predominantly Air or Fire. The elements that dominate your personality play a key role in determining how you deal with life issues. That includes how you deal with relationship issues. Knowing your elemental make-up can help you determine the type of people you want to establish relationships with and help you know when to take on more of or dump excess types of elemental energy when you have to deal with someone who is not a good elemental match for you. So how do you know what your elemental make-up is? As mentioned above, first look over the characteristics above. Are you a planner, a worrier, or a person who spends a lot of time engaged in mental processing or thinking about things? If so then you probably are predominantly Air. Do you anger easily or are you a very passionate person? Then you more than likely are a Fire person. Look at each of the elemental correspondences above and see which fit you the best. A way to get a more exact answer as to which of the 4 elements you are most dominant in is to take our 4 Element Personality Test and to study the 4 elements more in-depth. 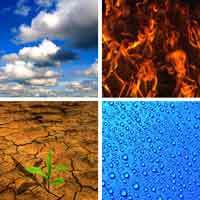 You can learn more about the 4 elements in our Basic Magic Course or our Four Element Short Courses. Right now is a great time to begin your study of the 4 elements with our free offer for the Level 1 Basic Magic Course. Just email us at info@shamanschool.com and ask for the details. You can also take our 4 Element Personality test for free by clicking HERE.